“Doesn’t he look like he’s trying to get into a body?” asks Sara Shelton Mann, director of ECHO / riding the rapids, leaving her seat in the audience to join one of her principal dancers on stage. The dancers’ responses, after she resumes her seated anonymity, range from graceful to violent, ultimately crystallizing in a symbolic reality where every decision reflects a previous one. 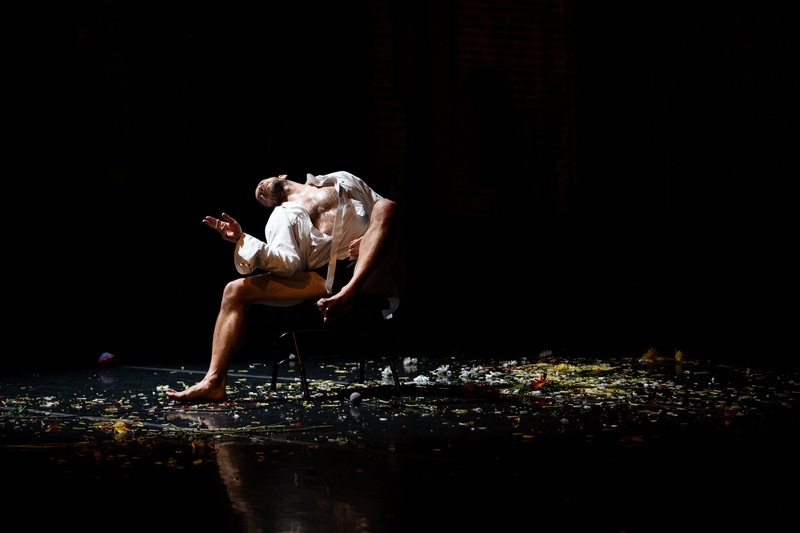 Their performance on October 11 at ODC Theater built a world through solo and paired movement in which language and silence are perfect mirrors of each other. 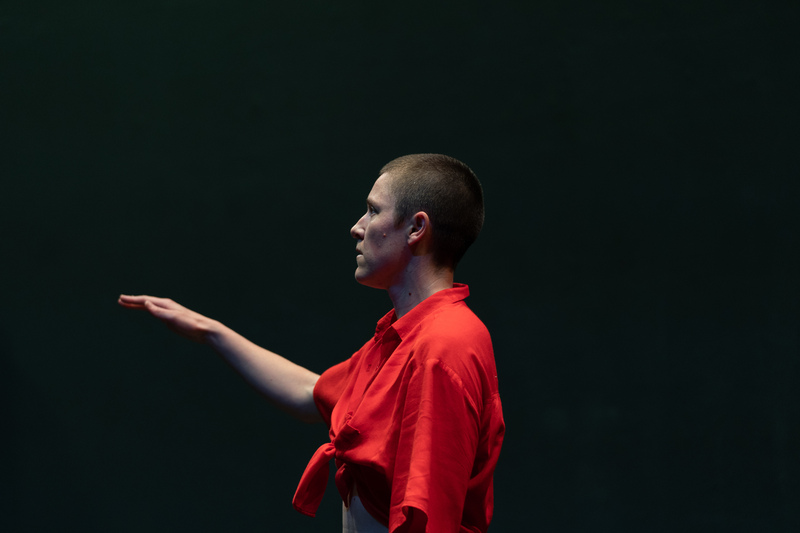 Mann, a noted figure in contemporary performance since the 1960s, developed the piece with collaborators Anya Cloud and Jesse Zaritt. 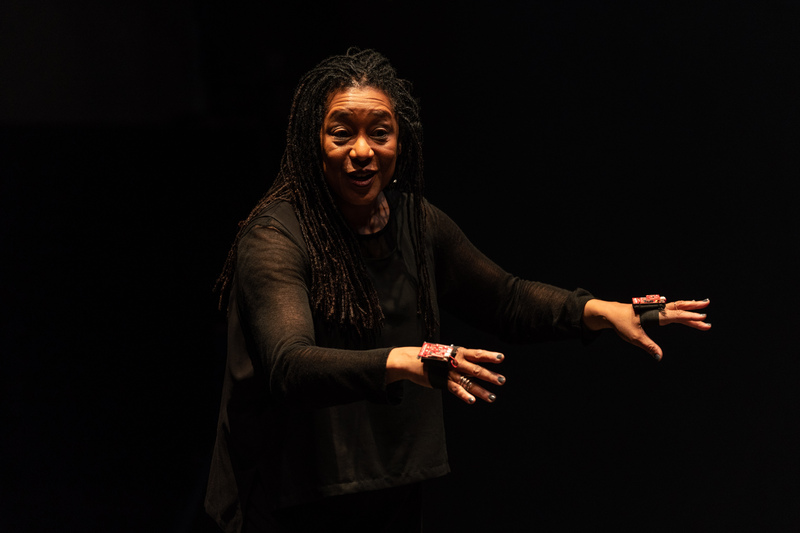 Pioneering electronic sound artist Pamela Z provided a live score of multi-textured vocal sounds, sometimes mixed with distorted guitar riffs and hints of pop. Throughout the hour-long piece, Z maintains a cryptic but reassuring presence behind a tabletop of electronics, acting as puppeteer of spoken and sung vocal layers, sometimes literally plucking phrases from thin air using what looks like a vocal theremin. At times she conducts cacophony, her vast soundscape spanning percussive noises to operatic arias. In a refreshingly light moment, she makes herself a martini and sits back to watch her sound creations take shape in the bodies of the dancers. Pamela Z as spinner of sonic worlds in Sara Shelton Mann’s “ECHO / riding the rapids.” Photo by Robbie Sweeny. The dancers’ expressive movements span the spectrum between quotidian and surreal. The two principal dancers, Zaritt and Cloud, each perform a solo. They flux in and out of echoes of Z’s aural fabric and each other’s movements. At times, they are shadowed by two other dancers, Abby Crain and Jesse Hewitt, who are dressed in assertive black, but move more tentatively, as if unsure of their own agencies. Designed as a site-specific performance by Mann and visual artist Amy Trachtenberg, ECHO / riding the rapids uses the full expanse of the theater. Dancers come and go through exit doors, cloak themselves in blankets stacked against the wall, and overturn a box full of objects: Amazon Prime envelopes, blue Ikea bags, and ropes. More ethereal materials, like white feathers and chalk, manifest as dreamlike symbols among more ordinary props. The piece progresses in episodes that reveal their interlocking architecture through movement and the language of Z’s score. The sublimity of the piece is felt most strongly in its two most captivating moments. In the first of these, Zaritt tangles the web between live and recorded voices with an exaggerated lip sync at the end of his dance solo. During Cloud’s solo, Pamela Z leaves her seat and approaches the dancer. She is wearing an apparatus on her wrists that generates vocal fragments as she moves. Cloud and Z mirror each other as they move, and vocal clicks and almost-words quicken until the recognizable melody of “Rock-a-bye Baby” tenderly emerges. Anya Cloud in Sara Shelton Mann’s “ECHO / riding the rapids.” Photo by Robbie Sweeny. The climax of the performance occurs during an episode of paired contact improvisation, a technique that Mann has honed over decades. The principal dancers and their shadow dancers overtake the space with various degrees of fluency, speed, and recognition of the other. At one point a brawl seemed to break out onstage. In this way, ECHO / riding the rapids ends on a note that cannot be argued. The performers exit the stage in perfect silence, a necessary conclusion to a language-filled hour spent in a dreamlike, fragmented world.